As a seasoned business traveler, you already know that flying through JFK, Newark, or LaGuardia can be a bit challenging—even on a good day. Between dealing with security, flight delays, and hordes of obnoxious fellow passengers, what is supposed to be a smooth transition to your destination can easily turn into a mess of inconvenience and annoyance. Add in a lack of free internet and an ordinary three-hour layover can seem like an eternity with no way to send email, check the weather, or even tackle a little bit of out-of-office paperwork. Thankfully, the powers that be have come up with a solution to ease the burden on passengers and make it easier to surf, stream, and work remotely. Effective immediately, all New York City travelers have access to four hours of free high-speed Wi-Fi at major terminals. Here’s what you need to know to take advantage of the program. Which Airports in New York City Offer Free Wi-Fi? Three major airports in New York City—JFK, LaGuardia, and Newark—now offer free wireless internet. Additionally, New Jersey’s Stewart Airport is also taking part in the program. For business travelers who regularly venture outside of the New York City area, the word that these locations are finally joining the rest of the world by offering free high-speed internet is good news. And there really is no catch. Passengers are allowed up to four hours of high-speed use per session. The internet works with laptop computers, smartphones, tablets, and other Wi-Fi enabled devices deemed safe for terminal use by the TSA. How Do You Login to Airport Wi-Fi in New York? According to the Port Authority, signage was placed inside the terminals with instructions on how to connect to the public network. However, in most cases the setup is similar to connecting at a local hotspot in your neighborhood: select the appropriate connection in your Wi-Fi options, agree to the terms of service, and watch a short advertisement. The connection will reset after four hours, but travelers are allowed an unlimited number of four-hour blocks. Can You Only Get Wi-Fi in Certain Terminals? Previously, JetBlue’s Terminal 5 in JFK was the only area with free high-speed internet for travelers. The only option in other terminals included a service called Boingo, which was free for thirty minutes before requiring additional payment and was often frustratingly slow. Thankfully, this new system expands the coverage to all areas of the four airports listed above. How Fast is the Wi-Fi Connection? According to the Port Authority’s Robert Galvin, the free airport Wi-Fi connection offers download speeds ranging from 20 Mbps and up to 50 Mbps. This is comparable to most public connections at hotels or your favorite corner Starbucks. And it certainly is fast enough for a quick video chat, downloading a large file, or binge watching a couple of episodes of your favorite television series on Netflix. Officials at all New York City airports agree that data safety is important. However, business travelers need to adhere to a few additional personal rules to keep their information secure while on a public network. For example, save viewing sensitive data such as online banking, medical, or sensitive business information for a time when you are on a private connection. Hackers have been known to use large public Wi-Fi networks to mine identity data, so it really is best to not put yourself in a bad situation unnecessarily. Also, when you can, try to stick to websites with the “https” prefix. This signals that the site is secure, making it much more difficult for tech-savvy travelers on the same connection to snoop on what you’re looking at on your screen. And be wary of any popups that suddenly appear while on an airport connection that ask you for personal information other than the first setup screen when connecting according to the instruction signage. Are you traveling through JFK, LaGuardia, Newark, or Stewart Airport soon? 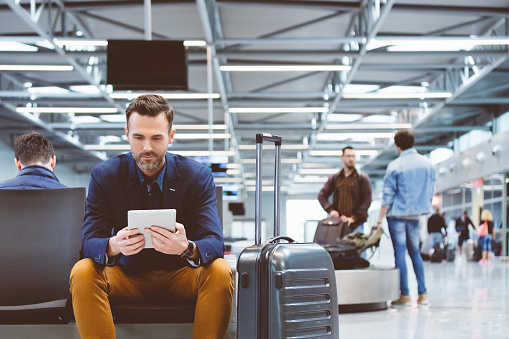 Look for more information and signage from the Port Authority on-site as to the login process, how to connect, and what to expect when using free airport Wi-Fi in New York City.